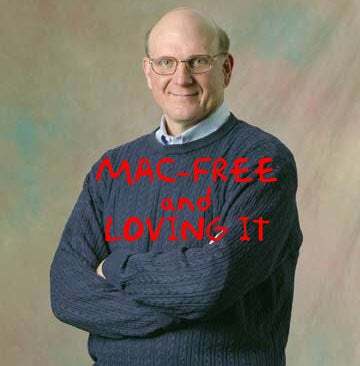 My buddy Todd at TechFlash reports that Microsoft boss Steve Ballmer went on an anti-Apple rant yesterday in NYC, saying "the tide has really turned back" toward Microsoft products, adding "The [downturned] economy is helpful." Apple gained about one point, but now I think the tide has really turned back the other direction...The economy is helpful. Paying an extra $500 for a computer in this environment—same piece of hardware—paying $500 more to get a logo on it? I think that's a more challenging proposition for the average person than it used to be. Say what you will about the merits of Windows vs Mac OS, but it is kinda funny for a software guy to suggest that it's the hardware that makes the computer. I don't, my sons don't, my wife doesn't...You're talking to a guy, though, whose dad worked for Ford, and once Ford sold Land Rover and Jaguar, we're selling the cars to get Fords, so you may have a weird outlier in me.